Gastrointestinal tract conditions such as diarrhea are commonly seen in pets and are often associated with an imbalance in the intestinal microflora. Restoring microflora balance is a key component of the effective management of these conditions. FortiFlora is a nutritional supplement that contains a probiotic, Enterococcus faecium SF68, for the dietary management of pets with diarrhea. This probiotic has been shown to be safe, stable, and effective in restoring normal intestinal health and balance. This unique supplement contains guaranteed levels of live active cultures in a digestible protein base. Sprinkle 1 packet on a pet's food daily for 30 days to achieve optimum intestinal health. It tastes so good it can be used to entice your pet to eat! Availble now with purchase is a $5.00 Rebate Coupon with the purchase of one FortiFlora or a $10.00 Rebate Coupon with the purchase of one 12-lb bag or larger, or one case of any Purina Veterinary Diet Formula. Limit of three requests per individual. Cured my puppy's chronic diarrhea! Our new border collie puppy kept getting loose stools, sometimes it was even watery and bloody. I was very worried but the vet gave us Fortiflora and had us add a small amount to her food and it would clear it up within a day or 2. Jule stuck everything into her mouth to chew even though I provided chew toys. I would have to give her Fortiflora a day or 2 out of every week until she was about 5 months old. At the time, I would also boil a skinless chicken breat and chop it up into some cooked white rice and feed that for a couple of days. Great combincation of probiotics and antioxidents! Our dog suffers from chronic urinary tract infections due to a congenital abnormality and is also chronically constipated. She also has food allergies and is allergic to grass. At 5 years old, she's had more than her share of health concerns! She is on a special diet, gets a cranberry supplement twice daily along with a fiber supplement. We try and limit the use of antibiotics but when our dog is in pain with an active UTI, antibiotics are the best course of treatment for her. In reading about the benefits of probiotics, especially while using antibiotics, I had a discussion with our vet about adding them to our dog's food. She fully encouraged us to put our furry child on probiotics, and addded that probiotics might also help her better absorb not only food, but her food supplements and the latest course of antibiotics. Forti-flora also has anti-oxidents and vitamins, so in addition to the probiotic, it should also support the immune system. At the same time, we placed our dog on a diet for urinary tract health. The transition to a different food did not cause the temporary digestive upset we normally anticipate in a diet change, no matter how slowly we transition the food. I beleive this was due to our adding Forti-Flora to her morning meal. 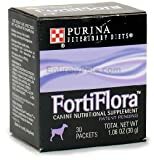 Since she's been on Forti-Flora, we've also been able to cut back on the use of a fiber supplement since her constipation problem has improved dramatically. While the product information addresses the use of the product for diaherrea, it seems to be working to help our dog with the opposite problem. This suggests that Forti-Flora is helping to balance the flora in her colon, just as it claims. Our vet charges [..] (not including tax!) for a box of [...] sachets. So we now get it online for about 65% of that. My corgi is so much happier now! I rescued a Pembroke Welsh Corgi from Denver Animal Control back in May. A few weeks later he had a bout of diarrhea in the middle of the night. Poor Murphy has been having these middle of the night accidents about once a month ever since. Additionally, I thought his appetite was pretty good, but he would only eat at home. When we visited my mother for the night , he preferred to go hungry (even when we were there for 3 days over Chrismas).